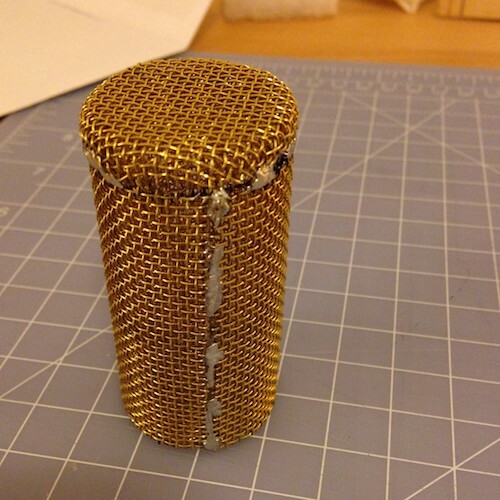 I’m still chasing down radio-frequency interference ghosts in the preamp – yes, I am still the Ghost Host – but I did promise a ribbon microphone build post! And the microphone seems to be behaving fine, so why not? First, you should know what a ribbon microphone is. It’s the first truly high-fidelity microphone design; those RCA diamond-shaped microphones you seen in old films? Ribbon microphones. They’re the only high-fidelity microphone you can make at home, if you have all the parts; there are no active components. They’ve never fallen completely out of use, having a characteristic sound which is particularly good for strings, classical instruments, and, curiously, metal; recently, they’ve come back into fashion. Perhaps you see my attraction. The active element is a nonmagnetic conductive ribbon, corrugated, and stretched between two high-power natural magnets. The vibration that sound waves in the air induce in the ribbon creates an electrical current, which is your signal. It’s a very low power signal, and the ribbon is crazy thin, making the microphone very delicate – I won’t be taking this microphone out. So let’s make one! This one’s built from an Austin Microphones kit, but you can just get the design plans and roll your own parts list if you want. First, we need to build the frame. 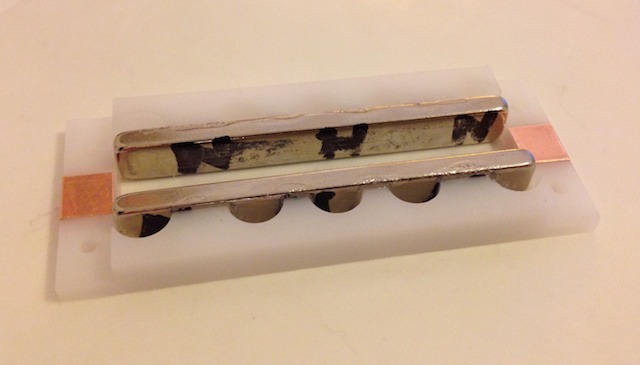 This is a nonconductive, nonmagnetic rectangle – in this case, plastic – to which you mount two long strip magnets on the inside, with north facing the same direction on each magnet. At the top and bottom of the frame, not touching either magnet, you add conductive pads; these pads are adhesive-backed copper tape, and wrap around the frame. This involved a little materials time, and I actually had to do it twice; the magnets are very strong, and flexed the frame a bit the first time. A second gluing solved that problem. On the back of the frame, I soldered leads to each pad. The aluminium ribbon we’ll be making and installing will touch both pads, and that’s how we gain access to out resulting signal. Next is to cut some ribbons, then corrugate them, and install them. I couldn’t take pictures while doing this, because it’s incredibly delicate! And requires both hands. The aluminium comes in rectangular foil sheets, which is shipped between two very thin layers of paper. First, this sheet must have thin strips cut from it, using a razor blade or similar knife. 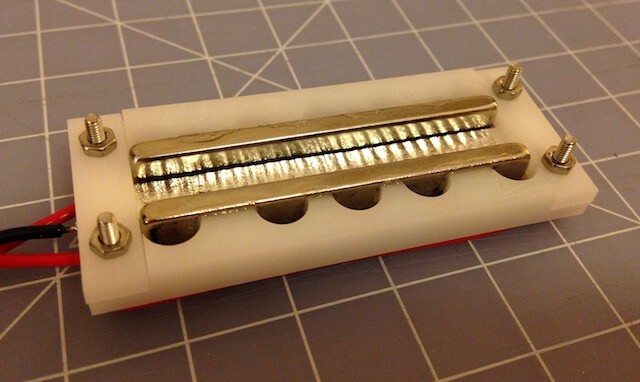 The strips should be as wide as possible, but still thin enough to fit between the two magnets, and must be of as consistent width as possible. It took a few tries, but I got there. Next, they have to be corrugated. This is done by putting the strip into a folded-paper sleeve, then pressing that sleeve – with ribbon inside – into a foam pad with a ribbed dowel, rolling the dowel along the length of the sleeve and ribbon. 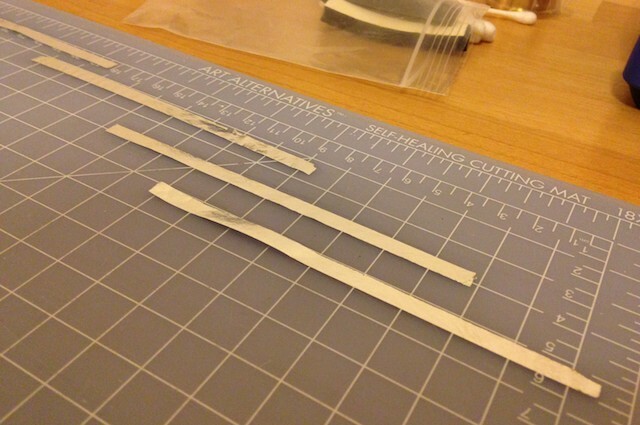 Paper sleeve, dowel, “ribbon positioning clamp” a.k.a. 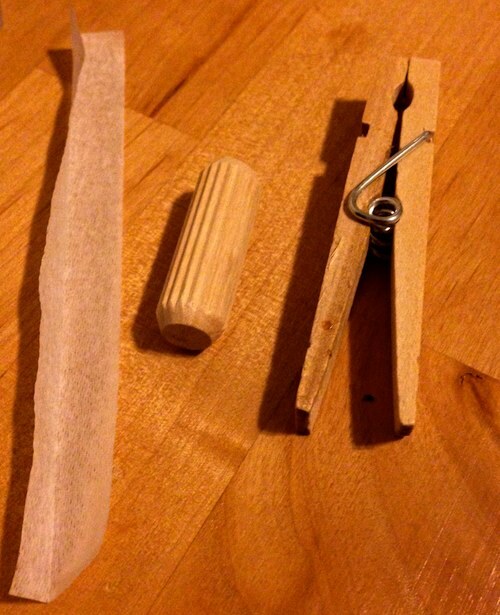 clothespin. This is a two-handed operation, so I couldn’t take a picture of the process, which is too bad, as it’s one of those things you can’t believe material this thin could possibly survive. The aluminium is so thin you have to manipulate it with toothpicks, which serve as kind of waldos. And even then, you will break it. And yet, it survives! Once you’ve corrugated the strip, it gets laid into the frame between the magnets, stretched taught, and clamped into place. The clamps hold the strip against the copper contacts plates we applied before. This is from the top side; the wires you see in the first try are underneath this. The “clamps” to which I referred are bars of plastic held in place with non-magnetic screws (and, unfortunately, slightly magnetic nuts, which is how I lost one of my ribbons). 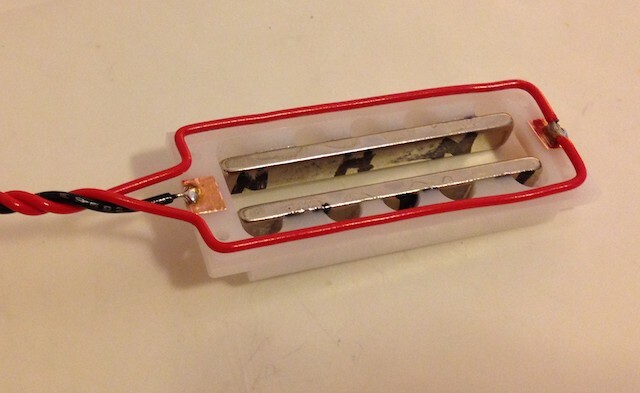 The ribbon is pressed against both copper plates, which are soldered to the red and black wires. This is called a motor, because it is a motor. It’s a very small motor generating very small amounts of electricity in response to very small amounts of air pressure. These are the functioning parts, right here. It’s kind of amazing how simple it is, but this is high tech of the 1920s, and the assembly environment has to be clean-room-of-the-1920s grade – I had to wear a mask to keep from blowing the ribbon away. 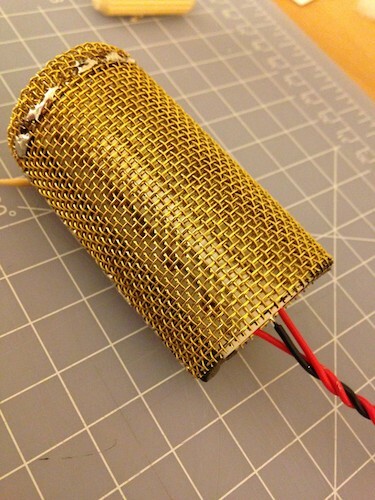 It’s layered mesh, two layers thick, of non-magnetic copper wire. You could use anything, as long as it’s not magnetic. I then added weather stripping to each side of the motor, and walked it up into the mesh. Now it’s starting to look a bit like a microphone! But we aren’t finished. Literally all that’s left to do at this point is solder the leads from the microphone to the leads on the transformer, and push the mesh cage the rest of the way into the microphone, and we’re done! I was kind of astonished at the simplicity. There are dramatically fewer parts than in the pre-amp, and the circuit is almost laughably simple. Cutting, corrugating, and seating the ribbon are the most difficult parts, and those are mechanical skills, not electrical. It felt as much like carpentry as electronics build – particularly with that dowel hanging around. It really kind of gets you back to the mechanical origins of all of this, in a really direct way, and is all the more awesome for it. And yet, critically: the microphone doesn’t sound primitive. 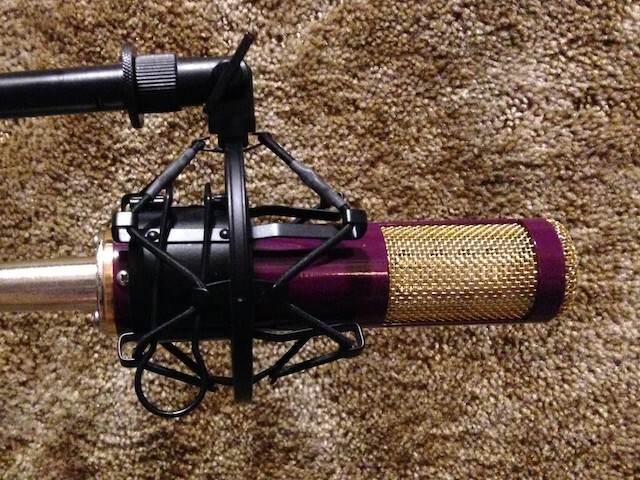 It sounds like a pro microphone, with its own characteristics and sound. A little noisier than most, maybe. I haven’t played with it as much as I’d like yet, but I will. As a project, I’d say build complexity is substantially lower than that of the pre-amp. 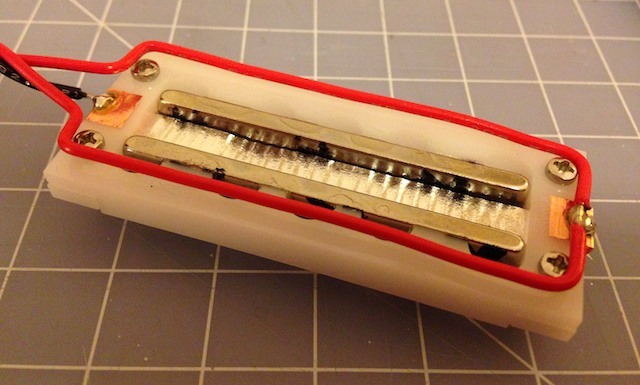 It’s electronically far, far simpler – if you can solder, you can do this, seriously – but mechanically more daunting. Other than waiting for materials to dry, it took less actual construction time. 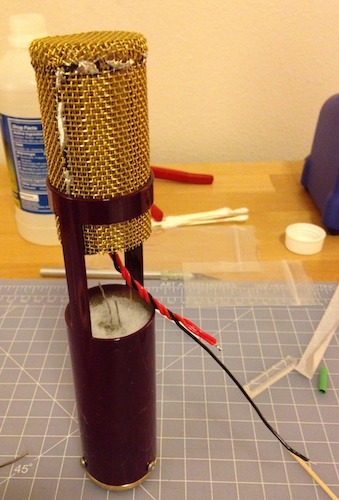 If you want to toy with DIY ribbon microphones but are intimidated by the pre-amp kit, just buy some other company’s pre-made pre-amp and build the mic. Your digital interface may provide enough boost without a pre-amp, but I doubt it; most won’t. Whatever you use, just remember: never use phantom power with this microphone. It’s not built for it and you’ll melt the ribbon. OLD SCHOOL IS THE BEST SCHOOL, except when it’s not and it melts from voltage. If this ghost problem is solved enough to do some test recordings, I’ll throw a couple of short examples online in a couple of days. It feels kind of like building and recording with stone knives and bearskins – but it doesn’t sound like it. And that’s cool. This is a related article in the Studio Buildout series of posts. I built my own studio, and documented the process.